Clarins Firming Night Cream Review (2018): Is It Worth Buying? Clarins Firming Night Cream-Dry Skin Review: Is This Night Cream Safe To Use? Clarins Extra Firming Night Rejuvenating Cream — Special for Dry Skin, US $92 for a 1.6 oz. jar, is a skin lifting and wrinkle-fighting night cream that has been specially formulated for use on dry skin. About Clarins Firming Night Cream-Dry Skin — Does It Really Work? Facilitate skin re-texturing and restructuring. Calm your skin, relieve it from fatigue and tiredness, and give you a more energetic look . Make your skin texture appear velvety. Enhance your skin’s radiance, improve your overall skin tone and relieve your skin of irritations. What Are The Ingredients In Clarins Firming Night Cream-Dry Skin ? Survixyl: Helps restore your skin’s optimal level of health and appearance, this ingredient helps correct the presentation of fine lines and wrinkles, making your skin surface appear more even. Stimulen: Contains rich amounts of collagen and glycerin, this proprietary complex deep conditions chronically dry and inflamed skin, softening it while also lightening dark marks. Lotus Zymbiosome: Derived from Lotus Root, this ingredient helps lighten your skin and brighten your overall complexion by inhibiting melanin formation as it also provides powerful antioxidant protection that protects and revitalizes your skin. Apply Clarins Firming Night Cream-Dry Skin every night to promote youthful looking skin. Always use sunscreen in the morning to protect your skin as some ingredients in this product may cause your skin to become more photosensitive, as well as to help enhance the skin lightening benefits that you can derive from this product. 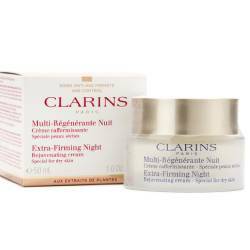 Clarins Firming Night Cream-Dry Skin has been specifically formulated for people who suffer from chronically dry and irritated skin. This product uses three proprietary complexes that have been thoroughly tested and clinically observed to improve the moisture and nourishment of dry, damaged and aging skin. This product is widely distributed worldwide and is easily accessible. This product’s manufacturer fails to openly disclose the full list of ingredients included in this product’s formula. 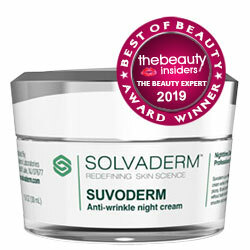 This product is significantly more expensive than most other overnight treatment creams which may make it challenging to keep and maintain in your nightly regimen over the long run, that is, depending on your beauty budget. Clarins Firming Night Cream-Dry Skin reviews are limited, providing little information about users’ firsthand experience with this product as well as their collective assessment of this product’s performance versus product claims. 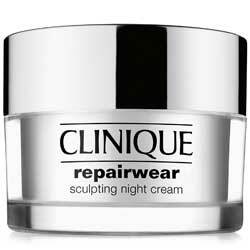 Does Clarins Firming Night Cream-Dry Skin Have Any Side Effects? 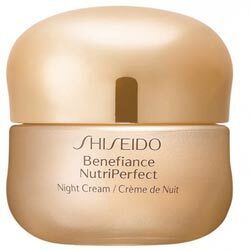 In the absence of a full list of ingredients and given the limited number of reviews, expect the side effects to be likely when you decide to use Clarins Extra Firming Night Rejuvenating Cream — Special for Dry Skin. Take note that, just like any other Clarins skin care product, this one contains fragrance ingredients which can agitate your skin. As a precaution, always perform a patch test to check for any adverse reactions you may have against one or more of this product’s components. When irritations appear, discontinue product use immediately. Clarins Firming Night Cream-Dry Skin, for all the hype it makes about what this cream can do for you while you sleep in sweet slumber is slow to provide details about what every jar of this product is made of, and how these come together to help rejuvenate your skin. In any case. this product is not for everyone so choose wisely and choose accordingly with your skin care and most pressing needs.